Ever consider what is possible from a park model? Modern designers and builders are continuously pushing the boundaries of what can be achieved in terms of the quality standards of interior finishes. 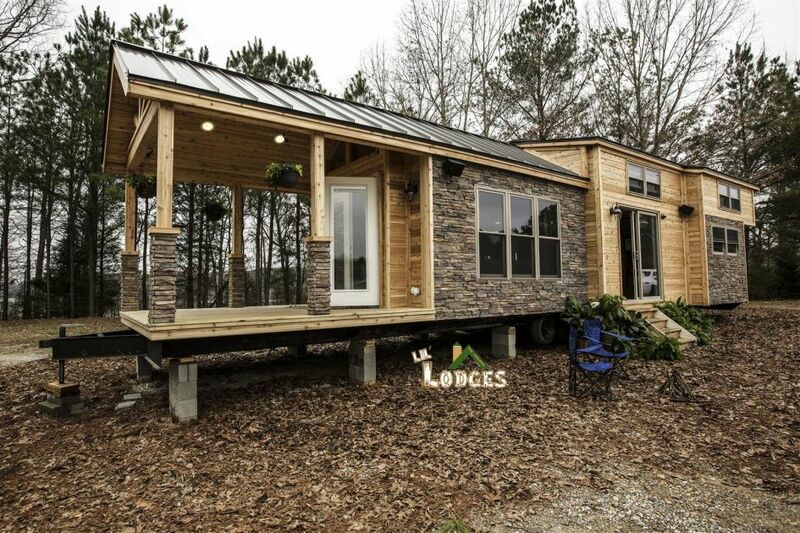 Today we are going to take a look inside an attractive park model by Lil' Lodges. 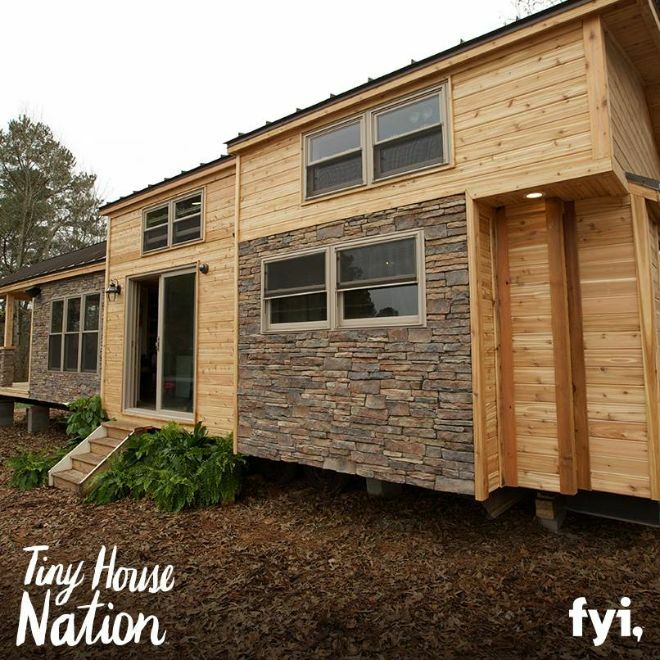 This contemporary example featured on FYI Network's Tiny House Nation was approached with the intention of creating a park model which feels more like a house. This gorgeous park model has two bedrooms and one bathroom. 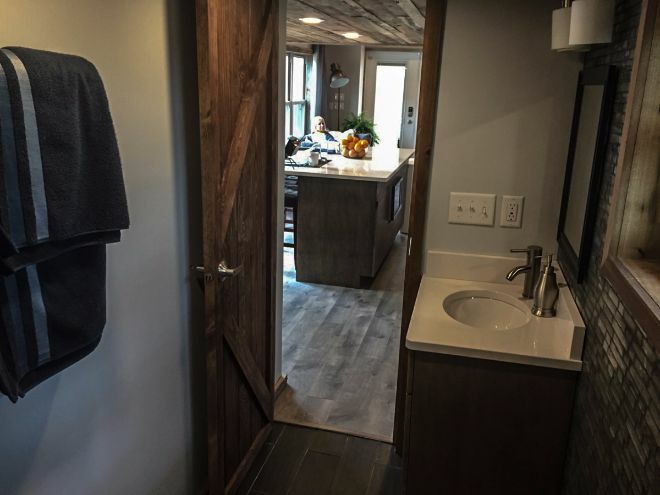 It is a fantastic example of the quality of finishes which can be achieved in a mobile home. Let's explore further, we are sure you are going to love this one! 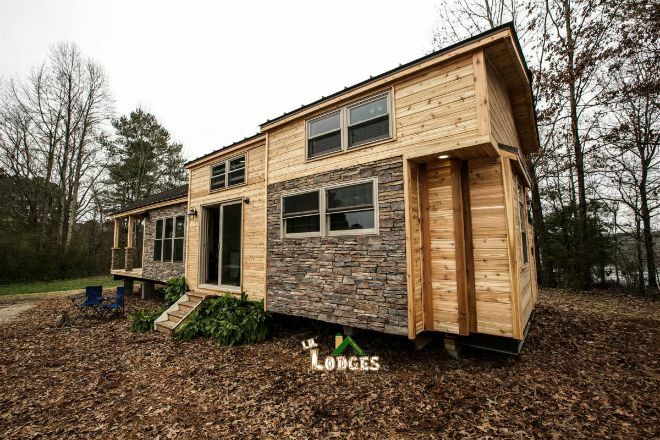 The exterior of this movable cabin is finished with a combination of wood and stone. They perfectly blend together to create an eye-catching construction made from natural materials. This ample-sized park model features an enormous over-sized porch. The log cabin lifestyle demands a good porch to sit on, and this design offers an expansive covered deck which could easily be furnished with a large dining set. Given a few years, this light-colored wood would blend effortlessly into the natural environment, taking on a lot of the character of the forest or hills. The main living room is a sight to behold! The soaring cathedral ceiling, large windows, and skylight ensure plenty of natural light fills the home, allowing the designers to use attractive darker tones throughout the home. 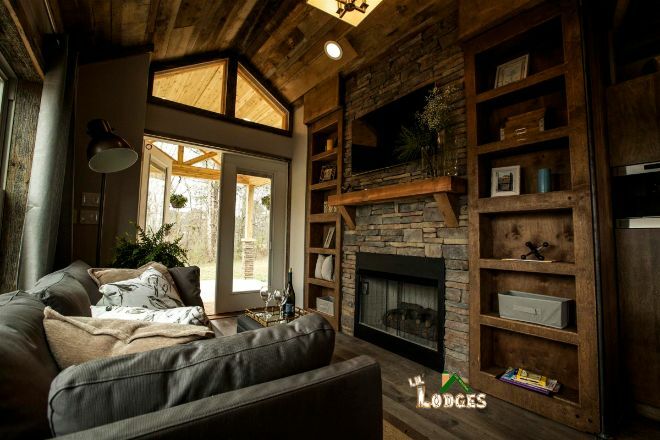 The rustic wood finishes create a very cozy space whilst that gorgeous stone fireplace will effortlessly heat this quaint floor plan. The kitchen continues with the dark wood theme, where the natural grain of the wood is enough to decorate this attractive space. High-quality appliances give this room a modern feel, whilst that large sink is a beautiful feature. 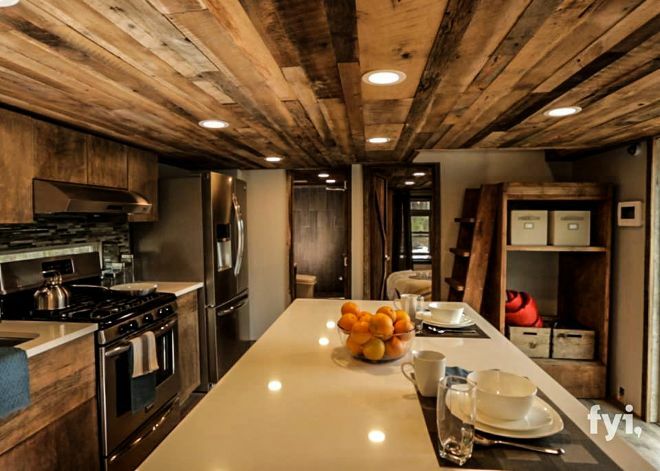 The rich tones in the low ceiling are a wonderful use of wood. 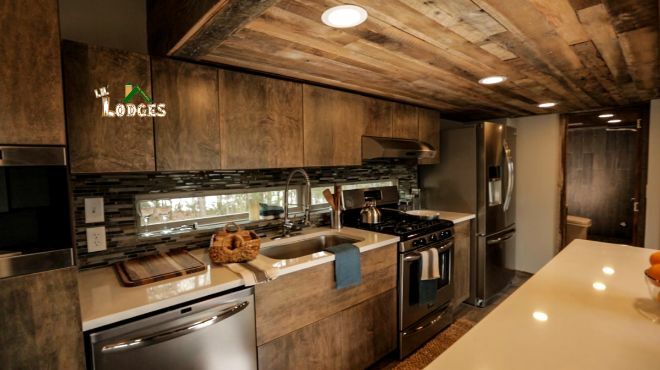 The light-colored countertops add a great contrast to the darker, rustic finishes. The master bedroom is located at the rear of the floor plan and benefits from plenty of large windows. 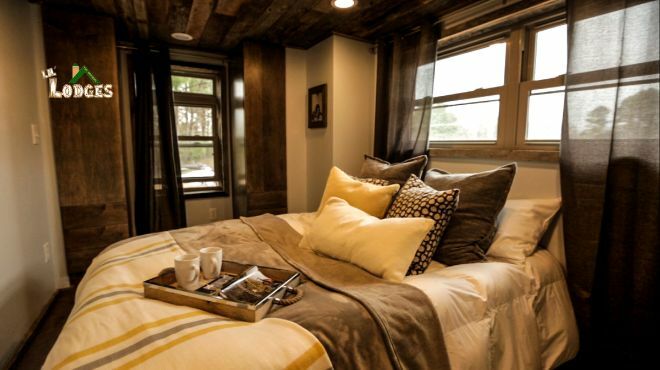 The rustic wooden ceiling and cabinetry add a sense of earthiness to the room, whilst the inviting bed and net curtains make sure the room doesn't feel heavy. 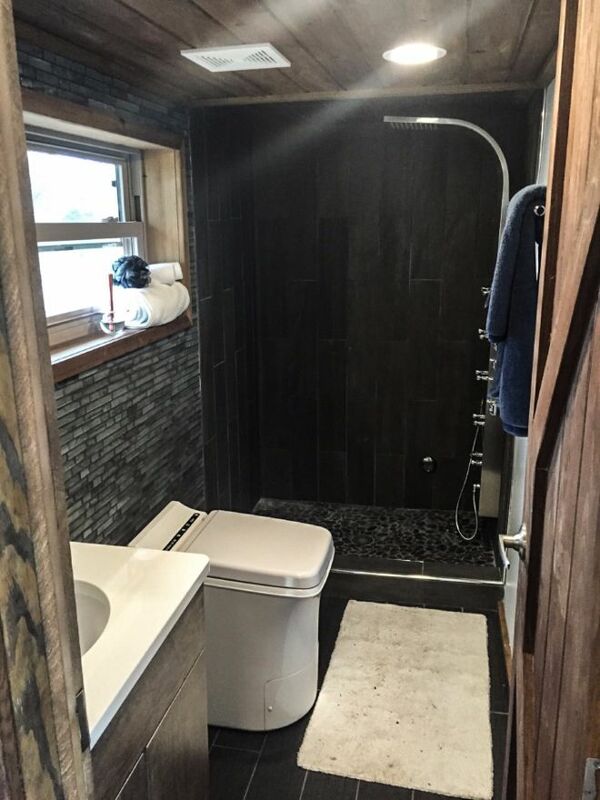 The bathroom is finished in a variety of grey tiles which create a clean and modern space. These darker shades are contrasted nicely by the brilliant-white fittings. Looking out of the bathroom into the main living area of the house, we can see that the bathroom is spacious and doesn't have that cramped feel which some park models suffer from. 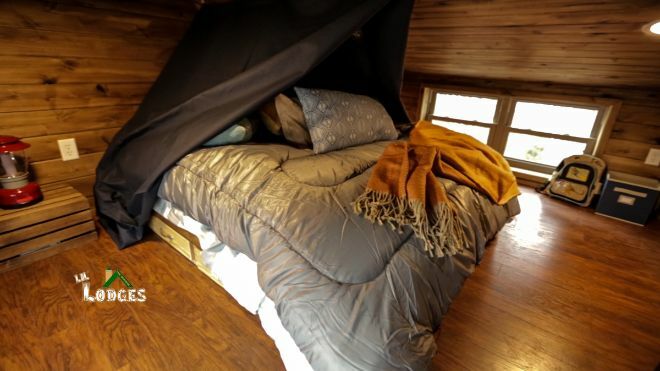 The loft space in this park model has been utilized as a second bedroom. With less natural light up here, the designer has opted for a lighter shade of wood in comparison to downstairs. The room benefits from the cathedral ceiling with plenty of standing space. As mentioned, this park model was featured on Tiny House Nation. It is a fantastic example of what imaginative interior design can create. Did you enjoy the tour of this homely park model? SHARE with your friends on Facebook.